Lightweight, convenient and powerful, it’s easy to keep up with the dust and debris that can accumulate on hard floors with this electric broom from Dyson. The DC44 is designed to keep hard surface floors looking great in between regular cleaning, and it might even replace your standard vacuum once you see how effective it is at picking up the smallest dirt particles. Its cordless design only adds to its convenience, and you will also love its sleek and modern appearance. While this cordless electric broom from Dyson does have plenty of power, it also comes with an extremely small dust bin compared to other models. This might not be an issue for some consumers, but for those with multiple pets this could be a concern that should be addressed. Pet hair and dander can quickly accumulate making it necessary to stop and empty the small canister several times while vacuuming the floor. 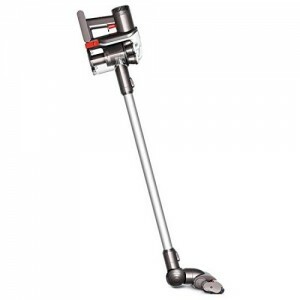 Dyson has designed the DC44 to be easy and convenient to use when you need to quickly clean up small messes. Its lightweight construction makes it easy to carry and maneuver, even when you need to sweep pet hair and crumbs off of stairs. The long handle allows you to stand up comfortably without hunching over, and it also adds to the electric broom’s sleek modern appearance. The minimalist design is not only attractive, it also makes the electric broom easy to store. 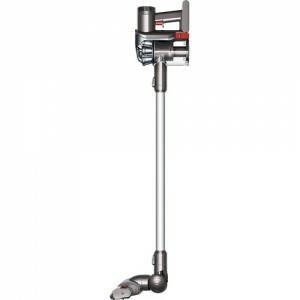 One of the most important features you want to look for in an electric broom is suction power, and the DC44 has plenty. It comes with “root cyclone” technology which allows it to easily suction up dust and pet hair on the first pass so you can quickly sweep up small messes and get on with the rest of your day. You also have the advantage of the V2 digital motor from Dyson which is designed to last for years without ever losing suction power. The battery can provide you with up to 20 minutes up running time, and can be fully recharged in 5.5 hours so the electric broom is always ready to go. The DC44 comes with everything you need to keep your hard surfaced floors looking great in between regular cleanings. The charger ensures that the battery is always ready, and the wall mount is great for convenient storage. You also have the advantage of the crevice tool for reaching along edges and into corners. The flat nozzle makes it easy to keep dust and pet hair off of furniture and drapes, but that is not what really makes this electric broom stand out. The head is motorized for easy maneuverability around corners and furniture legs. It comes with carbon fiber filaments for added strength and durability, and to ensure a smooth, long lasting performance. There is also a convenient trigger on the handle that can enhance the run time when you need to conserve power. Featuring a bag less design and easy to operate, this might be what you need to keep your hard floors looking their best.